Blame it on the Asian genes, but I've always had trouble finding sunglasses. I don't want anything with a wire frame and plastic nose pads, which limits my choices to one-piece plastic frames, which are then further restricted by the fact that very few stay put on a flat nose. For these reasons, I've saved myself strife (and money) by faithfully sticking to the pair of Chanels I bought in New York. But what's a girl to do when offered a pair of free sunglasses to review from the generous folks at ShadesDaddy.com? Why, accept, of course. The website features dozens of discounted pairs of designer eyewear from Bottega Veneta, Coach, Chloe, DKNY, Kate Spade, Marc Jacobs, Michael Kors, and Oakley, just to name a few. ShadesDaddy.com offered me a pair from their Ray-Ban, Versace, D&G, Ralph Lauren, or Carrera collection to review. After some careful deliberation, I chose the Ray-Ban Wayfarers in tortoiseshell--a classic go-with-anything alternative to my black Chanel sunnies. ShadesDaddy.com was prompt and responsive in providing me with a tracking code and emailing updates after I placed my order. The sunglasses arrived in a timely manner and came packaged with all the Ray-Ban paraphernalia (case, box, polishing cloth) promised on the website. I'm very pleased with the quality and authenticity of the sunnies. However, I kind of wish the tortoiseshell colour is as light in real life as it is in the product photo. As you can see below, in real life the Wayfarers look pretty dark. That hasn't stopped me from growing to love them though. They didn't fit correctly straight out of the case, but then again, I really don't expect any sunglasses to fit perfectly. A local optician re-aligned the frames for me. Now they fit just right. So, how do I feel about ShadesDaddy.com overall? They provide prompt delivery and good customer service. Their products are authentic and arrive in good shape. Their discounted prices are very reasonable. The website is easy to navigate and use. Free shipping is available for purchases over $99 (US only). Based on my own experience, the product photo can be slightly misleading. Aside from some oversized black frames, aviators, and the Ray-Bans, the selection of eyewear seems a bit dated. The return policy is very restrictive. Some brands are final sale, and the ones that can be refunded or exchanged must be received by the company within 7 days of you receiving the parcel. This means that if you're an international customer, you're stuck paying for expedited shipping or keeping sunglasses you don't really want. The shipping policy doesn't explain the costs of shipping internationally. The bottom line: As a prospective consumer, I appreciate the company's honesty and responsiveness, but I'm also wary of the restrictive return/exchange policy and the prohibitive cost of shipping something back. Research your dream designer shades and try them on in person at a local store if possible, then check ShadesDaddy.com to see if they have those same shades for a lower price. Read the fine print on their shipping and returns pages carefully. You don't want to be stuck with sunnies that don't fit or flatter. Thanks for the review. I wanted to get a pair of Ray Bans for my dad. Not the ones you have though, he would look funny in them. Like you, I also have trouble finding sunglasses that fit. Thanks for the very thorough review. Those shades are stunning though! 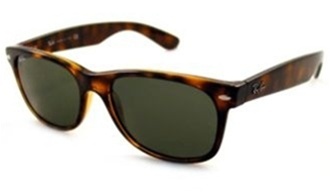 I love Ray-Ban's Wayfarers. They are the sunglasses famously worn by Audrey Hepburn in Breakfast at Tiffany's. Discounted bans? I'm all over that! I truly feel like I am scammed by them. I ordered a pair of Super Lucia shades and paid for 170 dollars. It has been 2 weeks since I placed my order and they have not replied ANY of my emails. I'm quite upset. YOu should definitely spread the word.